GUBAREVICHI: On the edge of Belarus’ Chernobyl exclusion zone, down the road from the signs warning “Stop! Radiation,” a dairy farmer offers his visitors a glass of freshly drawn milk. Associated Press reporters politely decline the drink but pass on a bottled sample to a laboratory, which confirms it contains levels of a radioactive isotope at levels 10 times higher than the nation’s food safety limits. That finding on the eve of the 30th anniversary of the world’s worst nuclear accident indicates how fallout from the April 26, 1986, explosion at the plant in neighboring Ukraine continues to taint life in Belarus. The authoritarian government of this agriculture-dependent nation appears determined to restore long-idle land to farm use — and in a country where dissent is quashed, any objection to the policy is thin. Milkavita officials called the AP-commissioned lab finding “impossible,” insisting their own tests show their milk supply contains traces of radioactive isotopes well below safety limits. 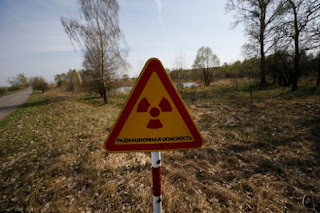 Yet a tour along the edge of the Polesie Radioecological Reserve, a 2,200-square-kilometer (850-square-mile) ghost landscape of 470 evacuated villages and towns, reveals a nation showing little regard for the potentially cancer-causing isotopes still to be found in the soil. Farmers suggest the lack of mutations and other glaring health problems mean Chernobyl’s troubles can be consigned to history. “There is no danger. 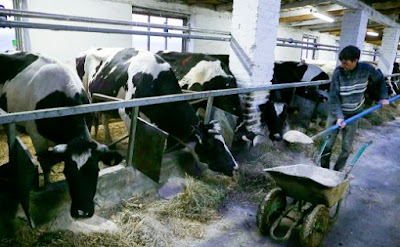 How can you be afraid of radiation?” said Chubenok, who since 2014 has produced milk from his farm just 45 kilometers (28 miles) north of the shuttered Chernobyl site, and two kilometers (a mile) from the boundary of a zone that remains officially off-limits to full-time human habitation. Chubenok says he hopes to double his herd size and start producing farmhouse cheese on site. His milk is part of the Milkavita supply chain for making Polesskiye brand cheese, about 90 percent of which is sold in Russia, the rest domestically. The World Bank identifies Russia as the major market for Belarusian food exports, which represent 15 percent of the country’s export economy. Since rising to power in 1994, President Alexander Lukashenko — the former director of a state-owned farm — has stopped resettlement programs for people living near the mandatory exclusion zone and developed a long-term plan to raze empty villages and reclaim the land for crops and livestock. Dr. Yuri Bandazhevsky, was removed as director of a Belarusian research institute and imprisoned in 2001 on corruption charges that international rights groups branded politically motivated. Since his 2005 parole he has resumed his research into Chernobyl-related cancers with European Union sponsorship. The state-run Minsk Center of Hygiene and Epidemiology said it found strontium-90, a radioactive isotope linked to cancers and cardiovascular disease, in quantities 10 times higher than Belarusian food safety regulations allow. Milkavita chief engineer Maia Fedonchuk rejected the findings. “It’s impossible. We do our own testing. There must have been a mix-up,” she said, adding they test samples from every batch of milk they receive from Chubenok and do an “in-depth” analysis every six months. She said the plant’s own lab analysis indicates its overall milk supply contains an average of 2.85 becquerels per kilogram. Ausrele Kesminiene, a doctor in the cancer research unit of the World Health Organization, said the consumption of radioactive food is linked chiefly to the development of cancer in the thyroid, a gland in the neck that produces body-regulating hormones. Thyroid cancer is typically not fatal if diagnosed early. WHO officials say they are dependent on reports from sister agencies in Belarus to alert them to cancer clusters or other signs of unresolved Chernobyl-related dangers. “Radiation effects and the development of cancers and the effects on the region are something which go on over a long, long period. So we haven’t seen the end of it,” Hartl said. “Undoubtedly there is going to be some increase in cancers.” Hartl said WHO officials have not received “any red flags” from Belarus. Environmentalists critical of Belarus’ Chernobyl cleanup record says that’s hardly surprising, since the government has funded no machinery to scrutinize corrupt practices in the food industry. As a result, they say, no Belarusian food maker has ever been prosecuted for using ingredients or producing goods containing excessive levels of radioactive materials. Irina Sukhiy, founder of the Belarus ecological group Green Network, said workers in food-industry factories have confidentially told her that ingredients and products are blended to dilute the impact of potentially radioactive ingredients from Belarusian suppliers bordering Ukraine. Such alleged mixing, she said, reduces the level of potentially carcinogenic isotopes in dairy products and processed meat below “the allowable dose, but it is still hazardous to health.” The division of the Belarusian Emergencies Ministry responsible for cleaning up the consequences of Chernobyl says that the rate of thyroid cancer in children runs 33 times higher than before the nuclear blast. It says thyroid cancer rates run several times higher in adults. Farmers working both on the edge of, and inside, the prohibited zone say they see no obvious signs of nuclear dangers, have been given no guidelines on reducing the risk of permitting radioactive isotopes into the food chain, and aren’t worried about this. A tractor driver on one of his neighboring farms, where an abandoned village has been demolished to make way for fields of grain, says he’s never seen an official testing for radiation levels in the soil. But Leonid Kravchenko said there was no reason for alarm. “Nobody’s in danger,” he said. Driving toward Chernobyl and into the nearby Radioecological Reserve required AP journalists to negotiate painstaking government permission. Inside the zone, Belarus has authorized an experimental farm to operate for the past decade. Today it contains 265 horses, 56 cows and apiaries buzzing with honey bees. The farm director, Mikhail Kirpichenko, said he’s permitted to pursue commercial ventures, including the sale last year of 100 horses to a Belarusian manufacturer of kumys, a popular beverage in swathes of Eastern Europe and Central Asia.